Time to change your oil again? Here is a fantastic discount for the taking! We need to keep our automobiles in tip top shape for the miles and miles we add to them as we are running around all the time with the kids, doing errands etc. 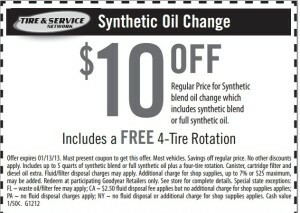 This offer even has the added value of having your tires rotated for free! Hurry in to your local Goodyear Auto Service Center and they will change the oil and filter, and keep your car running at it’s best. Search for your closest location here.